Good Hope is a residential neighborhood in southeast Washington, D.C, near Anacostia. The neighborhood is generally middle class and is dominated by single-family detached and semi-detached homes. The year-round Fort Dupont Ice Arena skating rink and the Smithsonian Institution's Anacostia Museum are nearby. Good Hope is bounded by Fort Stanton Park to the north, Alabama Avenue SE to the south, Naylor Road SE to the west, and Branch Avenue SE to the east. The proposed Skyland Shopping Center redevelopment project is within the boundaries of the neighborhood. Good Hope was the first permanent modern settlement of size in Southeast Washington. The Nacotchtank Native Americans were the first settlers to inhabit the area now known as Good Hope, living and fishing along the nearby Anacostia River. Captain John Smith was the first European to visit the region in 1612 C.E., naming the river the "Nacotchtank". War and disease decimated the Nacochtank, and during the last 25 years of the 17th century the tribe ceased to exist as a functional unit and its few remaining members merged with other local Piscataway Indian tribes. European settlement in Southeast Washington first occurred in 1662 at Blue Plains (now the site of the city's sewage treatment plant just to the west of the modern neighborhood of Bellevue), and at St. Elizabeth (now the site of St. Elizabeths Hospital psychiatric hospital) and Giesborough (now called Barry Farm) in 1663. Lord Baltimore granted ownership of the Good Hope area and much of what is now Southeast D.C. (giving it the name "Chichester") to John Meeks in 1664. "Anacostia Fort" was built on the heights at the present-day neighborhood of Skyland some time in the 18th century. 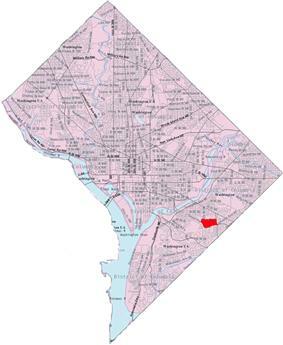 The area became part of the District of Columbia in 1791. Congress passed the Residence Act of 1790 to establish a federally owned district in which would be built the new national capital, and Marbury v. Madison Supreme Court case, purchased much of the "Chichester tract" some time in the late 18th or early 19th century. The growth of the Washington Navy Yard created the need to provide housing for the many new employees working at the facility, but little land was available for new construction in the area and housing prices were high. Consequently, in 1818, the privately owned "Upper Navy Yard Bridge" was built over the Anacostia River at 11th Street SE. A toll bridge, this bridge was designed to permit easy access to Anacostia so that housing could be constructed on the eastern shore of the Anacostia River. A road was built from the bridge to the town of Upper Marlboro, Maryland, and named Upper Marlborough Road (called Good Hope Road SE today). In 1820, the town of Good Hope, D.C., was founded around a tavern located near the current intersection of Good Hope Road SE and Alabama Avenue SE. Businesses began to construct buildings along Upper Marlborough Road toward the village of Good Hope, and a post office was established in the area and named Good Hope Station. In 1849, the post office's name was changed to Anacostia. Good Hope remained little more than a crossroads, however. Uniontown/Anacostia, Barry Farm, Congress Heights, and Randle Highlands were the focus of most housing and retail development until 1940. Even these communities remained isolated from one another, and most of the land between them was undeveloped until World War II. The oppressive need for housing during the war, brought about by a massive influx of federal workers to the capital, led to extensive development of Southeast Washington and the linking of Good Hope with other parts of southeast D.C.
^ Dyke, Lynne. "A Tough Sell: SE's Shabby Skyland Shopping Center Faces An Upscale Battle Against Development." Washington Post. September 10, 2006; Shin, Annys. "Wall Street Investment May Resurrect Skyland." Washington Post. June 10, 2006. ^ Humphrey, Robert L. and Chambers, Mary Elizabeth. "Ancient Washington: American Indian Cultures of the Potomac Valley." G.W. Studies. 1977. ^ a b c d e f g Burr, Charles R. "A Brief History of Anacostia, Its Name, Origin, and Progress." Records of the Columbia Historical Society. 1920. ^ There is some evidence that Smith was not the first European to visit the area. A Spanish vessel may have brought European explorers to the Anacostia River around 1550 C.E. See: Bryan, A History of the National Capital..., 1914, p. 47. ^ Williams, Brett. "A River Runs Through Us." American Anthropologist. 103:2 (June 2001). ^ a b c d Cantwell, Thomas J. "Anacostia: Strength in Adversity." Records of the Columbia Historical Society, Washington, D.C. 1973/1974. ^ Bryan, Wilhelmus Bogart. A History of the National Capital from Its Foundation Through the Period of the Adoption of the Organic Act. New York: The Macmillan Company, 1914. ^ "Anacostia Historic District - National Register of Historic Places Inventory - Nomination Form." National Park Service. United States Department of the Interior. October 10, 1978. ^ Centennial History of the City of Washington, D.C.Crew, Harvey W.; Webb, William Bensing; and Wooldridge, John. Dayton, Ohio: United Brethren Publishing House, 1892. ^ Croggon, James. "Old 'Burnt Bridge'." Evening Star. July 7, 1907. ^ a b Senkevitch, Anatole. Old Anacostia, Washington, D.C.: A Study of Community Preservation Resources. School of Architecture, University of Maryland. 1975. ^ D.C. Historic Preservation Office. Office of Planning, District of Columbia. Washington, D.C.: March 2007.Anacostia Historic District. Accessed 2009-12-26.